Occupation: Owner, Truman Taylor Insurance Agency Inc. Senator Larry Taylor is a lifelong Texan and Baylor University graduate raised in Friendswood. He and his wife Kerri have three adult children and two grandchildren. Senator Taylor owns Truman Taylor Insurance Agency in Friendswood, an independent agency started by his father more than 50 years ago. The agency merged with Galveston Insurance Associates in late 2017. Before his election to the Senate in 2012, Senator Taylor served five terms in the House of Representatives. Currently, Senator Taylor serves as Chairman of the Senate Committee on Education and as a member of the following committees: Higher Education, Water and Rural Affairs, and the budget writing Finance committee. In 2017, Senator Taylor was appointed to the Texas Commission on Public School Finance, which explored ways to update and improve how Texas funds its schools. 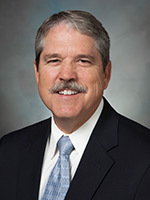 He also Co-Chairs the Joint Interim Committee to Study a Coastal Barrier System, which aims to identify methods of storm protection along the Texas Gulf Coast, and has served as a member of the Legislative Budget Board, a permanent joint committee responsible for developing budget and policy recommendations for legislative appropriations. After the 2017 legislative session, Senator Taylor was named a Pro Life Hero by Texas Right to Life, a Fighter for Free Enterprise by the Texas Association of Business, and an Effective Conservative by the Conservative Roundtable of Texas. He earned a strong pro taxpayer record with Empower Texans and a 100% voting record with the National Federation of Independent Business. In late 2017, Senator Taylor served on the legislative host committee for the Texas War Memorial, which was built on Capitol grounds after the passage of HCR 70 in 2015, which he sponsored. Senator Taylor is the recipient of the Bay Area Houston Economic Partnership's 2017 Quasar Award, which recognizes an outstanding leader who demonstrates a strong and continual effort to support the business foundations of the greater Bay Area Houston communities. He serves on the board of Hope Village, a residential and day program for people with developmental disabilities and as the Director and Chairman of the Board for Houston based Texan Bank. He is also the President of the Texas Conservative Coalition Research Institute. Senator Taylor represents Senate District 11, comprised of portions of Brazoria, Galveston, and Harris Counties.